In the end, after the last flower petals sifted down onto the stage, after the last curtain call and the last applause faded, it was almost as if Carla Korbes’ fabulous ten years at Pacific Northwest Ballet floated off like an opalescent bubble, a beautiful dream. Lucky for us, this decade in Seattle was very much a reality. 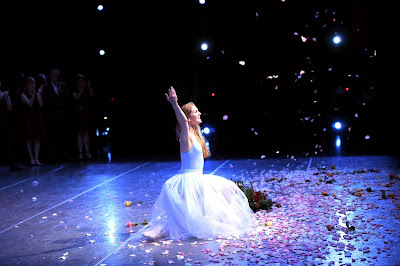 Her final performance was a gift, a reminder of all that Korbes (and her fellow dancers) have to share with us. PNB’s 2015 Encore was magic from the get-go, with the local premiere of former company member Andrew Bartee’s stunning dance/film creation “Dirty Goods,” a commission from the Wolf Trap Foundation for the Performing Arts. Quirky, contemporary, energetic and fun, it is Bartee’s finest work to date. Carla Korbes in Jessica Lang's "The Calling"
But the evening’s tone was set definitively when the curtain rose on “The Calling,” a solo dance by choreographer Jessica Lang. The lights came up on Korbes, in a cream-colored gown with a massive skirt, arrayed center stage like a perfect marble sculpture. As mezzo-soprano Sarra Sharif began to sing, Korbes’ sculpture came to life. She undulated her torso and her arms around that immovable gown, and wove her graceful spell on us. PNB soloists Elizabeth Murphy and Kiyon Gaines in Nacho Duato's "Rassemblement"
And through George Balanchine's "Jewels." The bittersweet evening could have ended with Korbes and Karel Cruz in the glorious pas de deux from Balanchine’s “Diamonds.” The two dancers shimmered like their namesake gems. When Cruz lifted Korbes into the air, she hovered as light as a feather before mortality prevailed and she drifted like a snowflake to the stage. The duet was exquisite, and it might have been an adequate goodbye. PNB Principal Dancers Karel Cruz and Carla Korbes in Balanchine's "Diamonds"
But PNB saved the best for last. 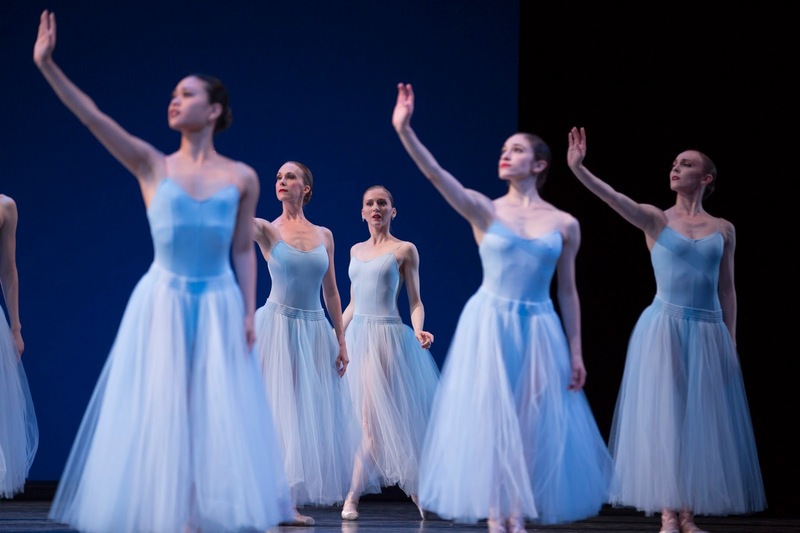 PNB's Carla Korbes, center, with fellow company members in Balanchine's "Serenade"
I was excited for the chance to see the dance again. But as the lights came up on the 17 women in their sky blue tulle skirts and bodices, I couldn’t help but think what a remarkably generous choice this was for Korbes’ final dance with PNB. 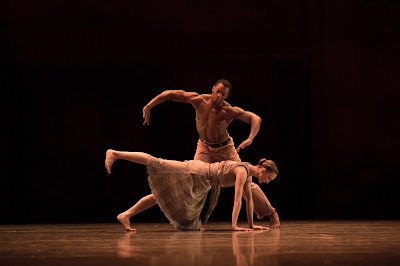 While Korbes did perform the central role, she shared the stage with fellow principal dancers Carrie Imler and Lesley Rausch, along with Batkhurel Bold and Karel Cruz, as well as with 21 fellow company members. Each had her/his moment at center stage. Each was beautiful. PNB Principal Dancers Lesley Rausch, Batkhurel Bold and Carla Korbes in Balanchine's "Serenade"
In the end, though, the night belonged to Carla Korbes. She glowed from within. The audience witnessed a woman who was truly one with the dance. It’s something we have come to expect from this ballerina. But on this particular evening, Korbes gifted her own artistry to every dancer on stage with her, and to the thousands of us who watched her perform. Korbes doesn’t count the beats in the music. She feels them. She doesn’t simply perform the steps. She inhabits them. And, on this magic occasion, her fellow dancers seemed to follow her example. For one last, enchanted evening, we held our collective breath throughout, mesermized, until Steven Loch, Price Suddarth and Dylan Wald lifted Korbes up above their shoulders and slowly walked her to the rear of the stage. Korbes' blue tulle skirt caught the breeze, as bewitched as those of us who soaked in the final notes, the final steps, the final PNB appearance of this wonderful artist. The places I saw here are really wonderful, celebrating a special event like this with the beauty of nature is really cool. When you are in this place, there's nothing you can do than to be happy. I really liked Seattle venues here.